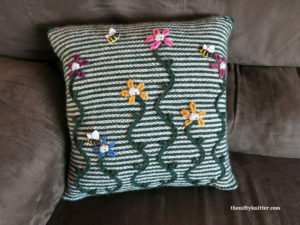 My mom always used to tell me “April showers bring May flowers.” The May Flowers Pillow captures the image of a new field of flowers growing and stretching toward the sky. Bees love these new flowers and fly about them searching for nectar. The pillow is constructed with slipped stitches, mini cables, and bobbles. 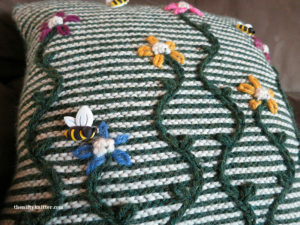 The flower stems and centers are knit as the pillow is knit, and the petals, leaves, and bees are added afterwards. 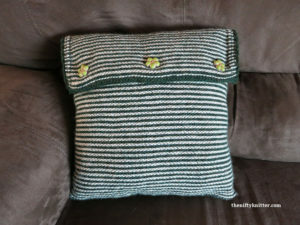 The pillow can either be knit as a closed pillow seamed at the top, or as a pillow cover with a button flap in the back. The finished dimensions are approximately 12″ by 12″ (30 by 30 cm). Approximately 150-180 yards of dark green worsted weight yarn. Approximately 120-150 yards of cream worsted weight yarn. Approximately 1 yard each of six colors of worsted weight yarn for flower petals. Decorative bee buttons (optional) with matching thread. Sewing needle to attach buttons. Tapestry needle to embroider petals and leaves and to weave in ends. 12” by 12” (30 cm by 30 cm) pillow form. Three 3/4” (19 mm) buttons with matching thread. Stuffing OR 12” by 12” (30 cm by 30 cm) pillow form.